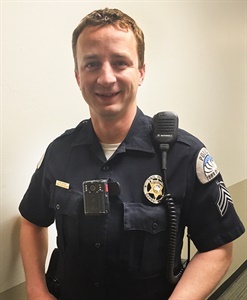 Officers from the Vail Police Department this week started recording interactions on a new body worn camera system, joining Avon and Eagle along with other departments across the country. Sgt. Luke Causey shows how the new cameras will be worn. Following the recommendation to utilize the technology from the President’s Task Force on 21st Century Policing, Cmdr. Daric Harvey says the department began researching video systems throughout the nation. Five leading companies were identified using public and private reports on systems that were currently being used in other departments. After a six month research project and 60 days of product testing each, the department has purchased the COBAN Echo camera, which is being integrated with the current patrol car cameras the department has been using for the past eight years, according to Harvey. The Echo cameras were more cost effective than other systems and met the department’s needs to accurately record incidents. Harvey says 40 cameras and a back-end storage system have been purchased within the project budget of $58,000. Police Chief Dwight Henninger says the body camera program will be used to enhance transparency and evidence collection while balancing the privacy concerns of the public. A draft implementation policy was presented to the Town Council on May 3 and has since been adopted by the department. The policy outlines instances when cameras will be activated, such as enforcement actions and use of force, as well as an overview of privacy protections examples, including but not limited to hospitals, places of worship and victims of crimes. Vail’s policy was drafted based on several model policies, including guidelines from the International Association of Chief’s of Police and the Colorado District Attorney’s Council before being modified using local input from community groups in Vail. The policy ensures that those with a legitimate public interest may request a copy of video recordings, but still protects recognized privacy issues. The policy is available on the department’s website at vailgov.com/police.